I’ve been patiently waiting for a Pentax 6×7 to cross my path for a while now. 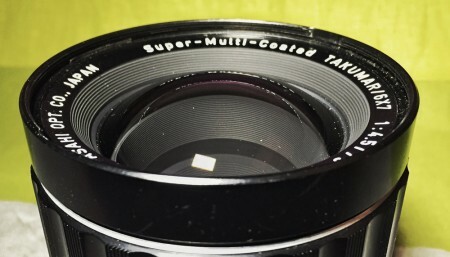 Ten days ago I finally stumbled across an exceptional example at a profoundly good price, and then added a cheap lens. 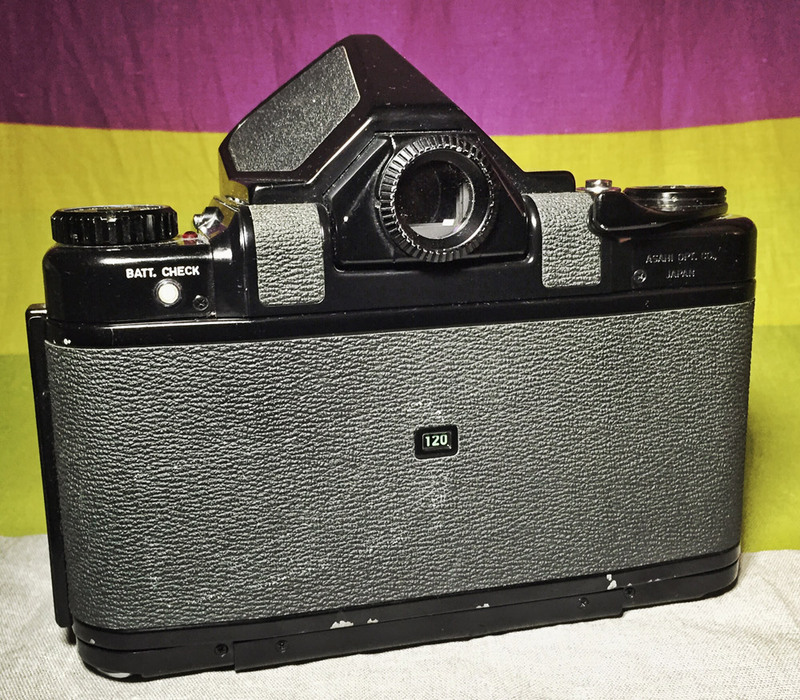 It wasn’t really borrowing that Mamiya RB67 from Tim Rasmussen — though it certainly helped. 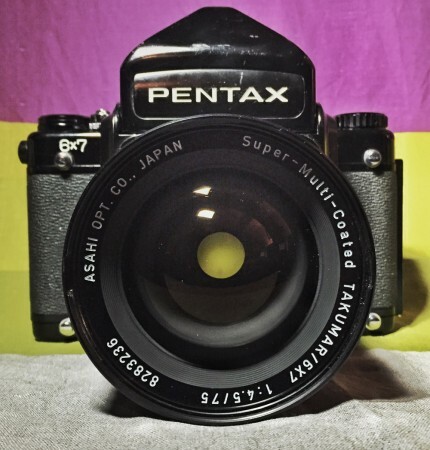 I was already drooling over the behemoth Pentax 6×7. I found the Pentax at Englewood Camera when I stopped in on a whim during a day of cruising for test cameras at thrift stores. The asking price was really too good to pass up and though I hemmed and hawed, I decided it was worth spending some of my last overtime on. The camera came with an original Pentax hard leather carrying case but no lens. The case is designed to carry the body with the 105mm f/2.4 kit lens and hood, with a space for the much-loved wooden grip. I spent the rest of the weekend looking for a lens. 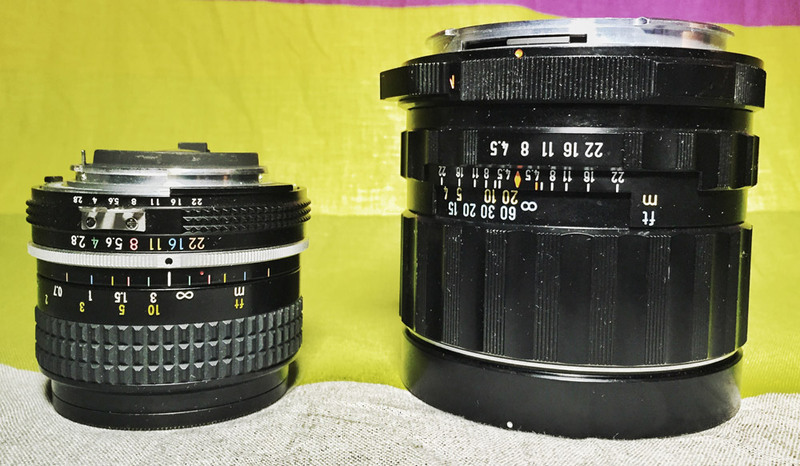 I wanted to get that famous 105, but those I found on eBay were too expensive or too worn, and even now the only one available from KEH.com is listed in “AS IS” condition. There were plenty of macro and portrait lenses, and loads of other stuff. But no 105s. I prefer wider to longer most of the time, and I didn’t want to start off with just a 165mm or somesuch. I finally found a very reasonably priced 75mm from Roberts Camera’s Used Photo Pro via eBay. They listed it as having internal haze, but what haze I can see in it is very minor. I’m hoping it takes decent enough images for a while until I can find that preeminent 105mm. I can say that I’m very impressed with this seller’s incredibly fast shipping, good descriptions and fair prices. The 75mm f/4.5 Asahi Pentax Super-Multi-Coated Takumar 6×7 lens arrived in just a few days and is a phenomenally lovely piece of glass. It’s a wide normal lens, being the equivalent of about a 40mm on a 135 camera. The body has a few scrapes on the bottom of the back cover and some tape residue on the back leatherette. There are a few other minor scuffs, but overall the camera is in pretty great shape for its age. Based on its JCII Passed sticker it was certified for export in July 1982. Its serial number indicates a late 6×7 model with mirror lockup, which is what it seems to be. Contrary to my usual preferences, the Pentax 6×7, 67 and 67II all require a battery to fire the electronically-timed shutter. They also require you to have film loaded. Fooling the camera for testing purposes requires either an empty backing paper on a spool or a shutter key — an accessory originally included with each camera that resembles a thin coin with a protrusion on one edge, used for checking shutter function without film and for installing the strap lugs. I didn’t get one with mine, but a penny works for the strap lugs. That’s right, installing the lugs. 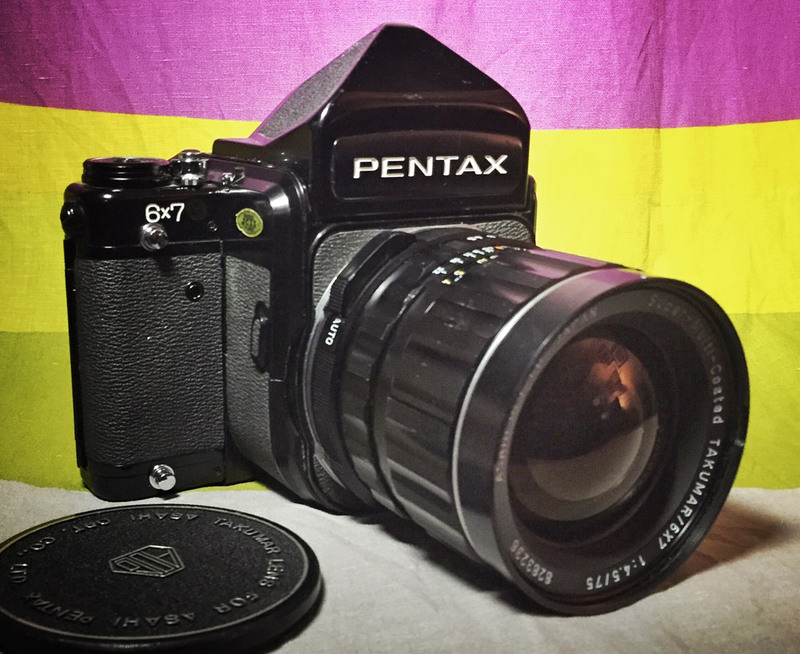 Pentax 6×7 System cameras have four notched posts near the corners of the front of the body for attaching accessories, one of which is a set of attachment points for a strap. The wooden grip mentioned above uses the same posts. I learned in Photojournalism 101 to hold my camera with my left hand underneath and cradling the lens. This allows you to tuck your elbow into your side and puts a lot of the camera’s weight on your left hand. Unless I’m using a pretty long lens, I can keep the edge of the body touching the heel of my hand. Keeping your elbows in offers more than support — stick them out to your side while holding a heavy camera and see how it affects your balance. With your arms out you’ll notice they shift more to help with you balance, which reduces the stability of your camera. The heavier the camera, the more involuntary fine movements you’ll notice in your arms as they attempt to compensate for both the weight of the camera and your ever-shifting balance. For that reason I don’t plan to bother with the wooden grip. If one falls in my lap I’ll certainly try and enjoy the accessory, but for the moment I believe that it would be more trouble than it’s worth with my usual shooting style. It does offer a cold shoe on top, though — a feature otherwise absent from this film-gobbling monstrosity. About that issue of weight — the 6×7 is heavy. Really heavy. Not as heavy as the RB67, though. The body weighs about 2.8 lbs. and the pentaprism viewfinder weighs just a smidgen over 1 lb. The 105mm kit lens weighs about 1.4 lbs., so the complete package is a bit over five pounds — more than a pound lighter than the RB67 with a 90mm lens. The 75mm lens I bought weighs closer to 2 lbs., so my setup is more like five and a half pounds as configured. So far I’ve found that the weight isn’t too bad given the big gripping areas on the Pentax. The large boss that sticks out the front of the body behind the lens mount has a tripod socket on its bottom and provides a solid place for the heel of that left hand. 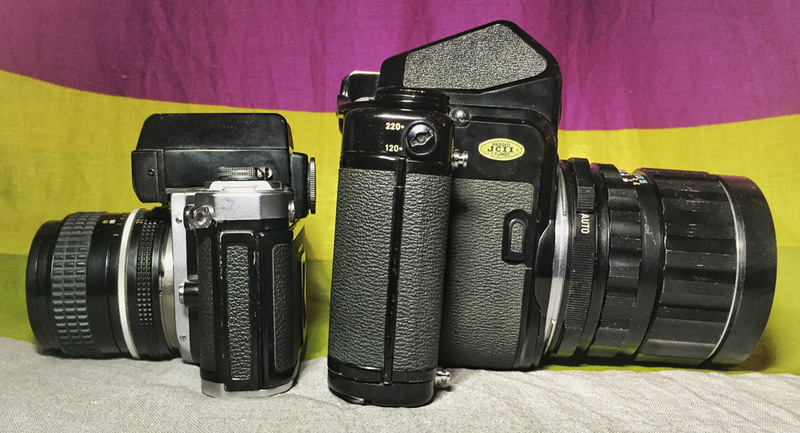 Going back to the pentaprism viewfinder my Pentax came with, I should mention there are others available. The focusing screen on the 6×7 is a huge ground glass surface with gridlines and a small split-image in the center – I believe it’s a Pentax BJ-81. This can be paired with a plain pentaprism, a TTL metering viewfinder which incorporates a light meter and couples to the shutter speed knob similarly to the DP-1 finder on a Nikon F2, or a waist-level finder that is a simple expanding hood much like that on a Rolleiflex. The split-image on the focusing screen confused me at first. On many cameras, notably all my Nikons, you rotate the lens in the direction you want the top half of the image to travel — clockwise (from behind the camera) moves the top half to the right and vice versa. But it’s backwards on the Pentax 6×7. Other focusing screens are available from both Pentax and Beattie, but as the Intenscreens cost as much as the camera did I’ll probably just learn to live with this one for now. The lack of built-in metering bothers me only very slightly. At this point I’ve been flying through so many camewrecks with absent, broken or comically-inaccurate meters that my Sunny-16th Sense is fully redeveloped. I can (and do) recalibrate or backstop with the free Light Meter app on my iPhone quickly and easily enough that it’s really no big deal to shoot without a meter. I may explore a TTL viewfinder at some point, but it’s not in my immediate plans. I took the Pentax 6×7 and a handful of Fujifilm Pro 400H to Doors Open Denver over the weekend. I didn’t visit a ton of places, but I hit a few really cool ones. 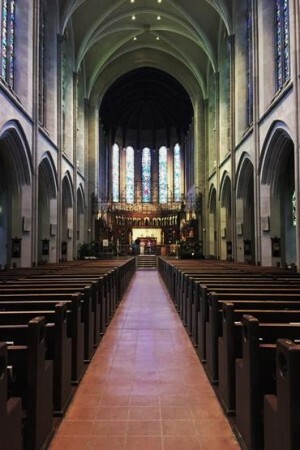 It was the first time I’d seen the inside of St. John’s Cathedral in the Capitol Hill neighborhood, the first time I’ve actually been to Rockmount Ranch Wear and the first time I’ve tried Fuji Pro 400H. Expect results in the not-too-distant future. I must admit that I had to switch bags for this one. The Domke F-5XB didn’t stand a chance against the ginormous Pentax 6×7, so I convinced my Nikon FM2 to loan me the Domke F-2 Ruggedwear for the day and set out to sooth this savage beast.